So, in the manner of the first school essay after the summer break, I give you an essay entitled ‘What I did on my holidays’. We made our first ever, and possibly only ever, trip to New York (or Noo Yawk as they seem to pronounce it over there). First impressions were not good. We were driven from the airport in a sedan car, or car as we would say. It was a nice car admittedly. A Cadillac. First time either of us had been in one. Any road up, travelling through the city is scary. Very scary. Indicators? Forget them. If any driver wants to change lane, he/she just does so. Our chauffeur was possibly the worst offender. At one point, he was in a left hand lane in gridlocked traffic (There is a lot of that.) and wanted to turn right. Trouble was, there were four lanes of traffic to cross. No problem to this guy, he just turned the wheel and went for it. There was much honking of horns (ooh, missus!) but when I opened my eyes (I couldn’t bear to watch this.) he had done it. Don’t ask me how. Second impressions weren’t much better. We were staying at a hotel near Times Square (There’s posh) and though there are plenty of restaurants, they are pricey, as we found out the first time we went for a meal. Basically, we were ripped off. We had chosen an Italian restaurant. It was so full, we had to wait for a table. To me, that is a good sign. If a restaurant is that busy, the food must be good. How wrong can you be? First off, the waitress was a bit unpleasant; she just pointed out a table to us and threw a couple of menus in our general direction. Surly doesn’t come close to describing her manner. We ordered a small pizza and a pasta dish - it was an Italian restaurant; it’s what they do best. You would think. The pasta could be described as okay. The pizza could be described as oh dear. We chose something that had a cheese topping rather than the usual tomato. I say cheese. On the menu, it certainly looked like a cheese-topped pizza. Indeed, when it was placed in front of us, it looked like a cheese-topped pizza. What it didn’t taste like was a cheese-topped pizza. In fact, it was impossible to identify its actual flavour as it didn’t have any. It was certainly a proper pizza bread base; that much is true. However, the topping had no discernible flavour at all. It was just... white stuff. Horrible. What made this whole experience even worse was that we were charged 12 dollars a glass for some really nasty house wine and then, when the bill was presented to (flung at) us, there was a service charge of fifteen per cent included. Not only that; there was a space for you to add a further gratuity if you wished! Flaming cheek! So I left that restaurant feeling mighty grumpy, I can tell you. As we headed to our hotel, Mrs G spied a shop which sold shoes. If there is one shop she can’t pass without a ‘quick’ look, it is a shoe shop. I waited outside the shop. And I waited. And I waited. I amused myself with a bit of people watching. As this was Times Square, it was busy, so there was much people watching to be done. All shapes and sizes passed me by... Why is it all the ‘larger’ people always have food in their mitts? Some of the weirdest fashion statements were on show. High-heeled trainers? What is that about? They looked as ungainly and as uncomfortable as high-heeled fashion shoes, but they had a top resembling a training shoe. You know, those shoes that originated from the sports field where people train, as in, run. No chance of anyone running in these things. Anyone I saw seemed to have trouble just walking in them. I also actually heard a guy address his friend as bro. I thought that was only used in films, the way Scots in films say ‘hoots’. These things amused me no end. When Mrs G finally emerged from the shop I was less amused. It was a cold night and forty minutes spent outside a shoe shop was not what I came to New York for. And I was still miffed at being ripped off at that restaurant. As we started to head homewards for the night, I was getting annoyed that we couldn’t make much headway due to the masses of people. I have never before witnessed such crowds (I am a Motherwell supporter, after all.) and was struggling to make much progress. We came to a spot where some actory types were dressed as film characters. They were there simply to mingle with the public. No, I couldn’t understand that, either. An odd mix they were too. Batman rubbed shoulders with Captain America, Spiderman, Woody from Toy Story and, of all things, Elmo from Sesame Street. I wish I could apologise to Woody; I didn’t mean to elbow him out the way when he tried to shake my hand. Sorry Woody, you weren’t to know how the previous two hours had peed me off. It was interesting to see those places that had been sung about over the years. You would think that these tunes would be about something really special; strangely, many are anything but. Let’s start with Broadway. I don’t think I would bother giving it my regards. It is just a long avenue full of theatres. Or several avenues, if our tour guide is to be believed. Apparently any theatre in New York that can seat more than 500 is classed as a Broadway venue. The neon lights no longer shine bright(ly) either. Instead there are thousands of huge led screens flashing advertisements for electrical goods, perfumes, fashion, shops - anything. Of course, many are advertising the multitude of shows on offer; mainly Disney productions. They certainly shine bright(ly), though. You wouldn’t want to stare at them for too long if you value your eyesight. The biggest ads were reserved for the intersection with Times Square. The largest screen stretched for three of that well known unit of measurement - the football pitch. Our tour guide was full of such hyperbolic facts and figures. That biggest screen costs a company $2.5 million for a four week ad, he told us. I didn’t detect any magic in the air; just the smell from hot dog and hamburger stalls... Oh, and the stench of greed. 42nd street isn’t a particularly nice place either. And the song had it wrong when it called it the avenue I’m taking you to. It is most definitely a street according to the New York naming system - avenues run north to south while streets run east to west. Any road up [Shouldn’t that be avenue up? - Ed. ], 42nd Street has had a chequered past. From being the place where big musicals were staged in the first half of last century, by the 70s it had become the centre for some of the sleazier aspects of the business known as show. Gentlemen’s clubs and strip joints were the main fare on offer. It has cleaned its act up a bit since then and is now more family (or tourist) friendly. We also passed through Harlem on one of our bus rides; I’m guessing there is a Spanish bit. We also saw 59th Street, though I didn’t notice a bridge. To finish my little travelogue, I will end with something that truly shocked me. I am not a racist person. Never have been. However, a racist incident occurred while I was in New York and I still cannot work out how or why it happened. People in New York often hand out cds to passers by. My response is always to hand them back and say politely, no thanks, as I continue on my way. One day, a black gentleman handed me a cd and I responded in my usual way. Treating this as some sort of rebuff he shouted after me (and these are his exact words), ‘It’s only music! What’s the matter? Scared of black people?’ What the hell prompted that? Let’s move on to grambling matters. What happened last time we had a flutter (They can’t touch you for it.)? We lost. Not a penny piece back. Ho hum. Let’s not even bother with the details. Well, the footy season is at an end. You know what that means, don’t you? Blibbing horses. Yes we have to have a gramble on the beasties. Incidentally, did you know that the Dutch for ‘mount horses’ sounds exactly like ‘Gramble up the beasties’? No, didn’t think you would. So what has The Grambler randomly selected for our first week of gee gee grambling? I think you will agree, that is pretty whopping. One for this week? Gareth Bale has now joined two other Welsh Players by winning his second Champions League (or European Cup) medal. Who are the other two boyos to have achieved this? And finally, Cyril? And finally Esther, I have just heard that the most famous sports personality in the world has just died. 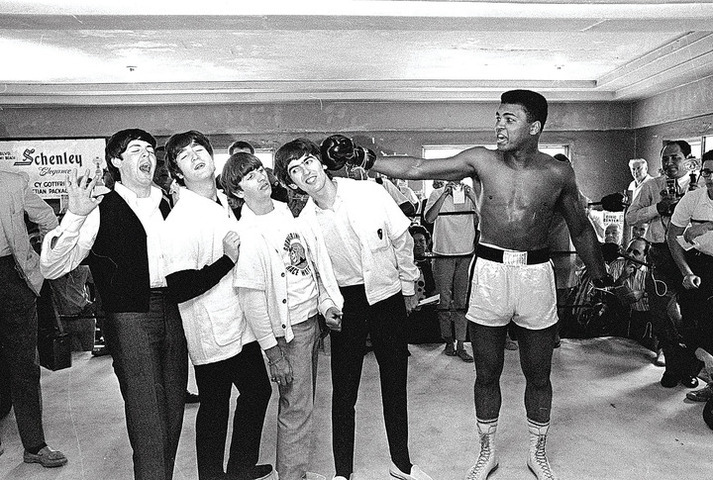 Muhammad Ali was, at one time, the most recognisable sportsman in the world. It wasn’t always so. In 1964 he was an aspiring 22 year old heavyweight boxer about to be given the chance to fight the world champion, Sonny Liston. Prior to the bout a British pop group was trying to get noticed in the States. A photoshoot with the world champion seemed a good publicity stunt. However, when Liston saw this ‘bunch of cissies’ he refused to go through with the shoot. Somebody decided to find out if the contender would be willing to do it instead. He was and various snaps were taken before the band were whisked off to their next engagement. Ali then asked, ‘Who were those cissies?’ Ali wasn’t expected to win that fight, but he did and the pictures from that photoshoot were suddenly seen everywhere around the world. Not bad publicity for the Beatles.